Schnelle, elegante Möglichkeit, eure Dokumente zu verwalten. 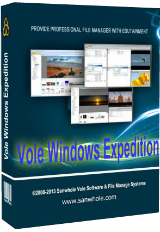 Vole Windows Expedition Pro 3.85.8122 war am 15. Januar 2019! als Giveaway verfügbar! Vole Windows Expedition ist ein anpassbares Dateiverwaltungstool, völlig kompatibel mit Microsoft File Explorer. Sein benutzerfreundliches Interface ermöglicht euch den Vorschau von Bildern, Audio- und Videodateien, Dokumenten usw. Darüber hinaus könnt ihr schnell Bild-, Video- und Dokumentengalerien oder eine uneingeschränkte Anzahl an Verzeichnissen erstellen. Die sensationelle Szenenwiedergabe-Funktion kopiert alle benutzerdefinierten Dateien und Ordner automatisch, Docking-Tab-Funktion ermöglicht euch Andocken und Anordnen von Dateien nach Wunsch. Keine manuelle Suche, Öffnen und Schließen von Dateien mehr nötig - und auch kein manuelles Anpassen von angedockten Objekten. So könnt euch eine Tasse Kaffee einschenken, die Software öffnen - den Rest übernimmt Vole Windows Expedition. Auch Funktionen wie Music Mate, Dual-Explorer, Lieblingsordner, Playback-Ordner, VMC Discovery, Countdown Timer, sechs wunderschöne Farbschemata usw. machen das Verwalten von Dokumenten zu einem Vergnügen. Wenn ihr keine Lust habt, jeden Tag die gleichen Ordner und Dateien öffnen zu müssen, wenn ihr eure Lieblingsdateien bereits beisammen habt, wenn ihr euch keine nutzlosen Verzeichnisse merken wollt, wenn ihr mehr Zeit für Kaffeegenuss haben möchtet - holt euch Vole Windows Expedition! Sanwhole Office ist ein Super-Office-Tools-Paket, leistungsstark, benutzerfreundlich, kostengünstig und vollständig kompatibel mit den neuesten Microsoft Word- und Excel-Versionen. Sanwhole Office bietet eine kostenlose 150-MB-Cloud, in der ihr eure von Sanwhole Office erstellten Dateien problemlos freigeben könnt. 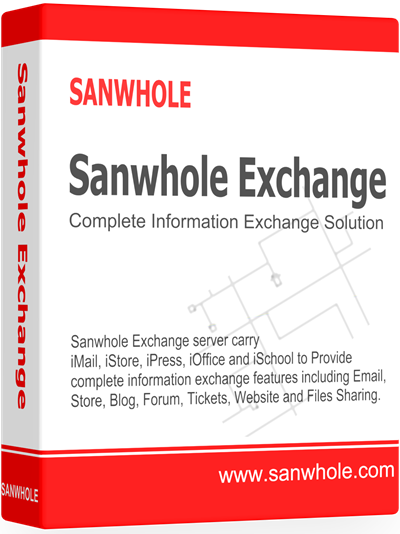 Sanwhole Exchange ist ein Server, auf dem iMail-, iPress- und iStore-Dienste ausgeführt werden. iMail ist ein Email-Server der Enterprise-Klasse, der Microsoft Exchange- und Gmail-Funktionen ausführt. iPress ist eine umfassende Informationsaustauschlösung für Blogs, Foren und Tickets. iStore ist eine kommerzielle und persönliche Online-Shop-Lösung. Activation is a bit on the manual side for this giveaway. 4. Now go to 'Download license file' and save file - I saved this in the same folder where I installed the software. 5. Start Vole Expedition and click the information icon - top right. 6. 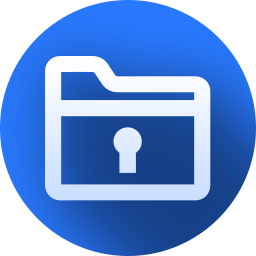 Select 'Specifiy License file' and search for the file downloaded in Step 4. I know most of you will have worked this out already, just thought it might be helpful to lay out the steps I took. I havn't gone through all the features and buttons this programs have to offer. But i have a 4 GB Ram and Dual Processor, even then this program hangs and hogs the memory. If something slows down my system its a nuisance and not worthy of keeping. Complicated way of registering. 98 MB of file size. I have been using XYplorer 19.50 and there is no lag in the memory and my system doesn't hang. Absolutely flawless. This is not for me, perhaps someone could use it. I uninstalled and deleted the Giveaway file and emptied the Recycled Bin. I havn't gone through all the features and buttons this programs have to offer. But i have a 4 GB Ram and Dual Processor, even then this program hangs and hogs the memory. If something slows down my system its a nuisance and not worthy of keeping. Complicated way of registering. 98 MB of file size. I have been using XYplorer 19.50 and there is no lag in the memory and my system doesn't hang. Absolutely flawless. This is not for me, perhaps someone could use it. I uninstalled and deleted the Giveaway file and emptied the Recycled Bin. You're right of course, but it's good that Endemondo gave us the warning - particularly as the software claims to work on Vista systems, which were very much lower spec than today's. shegeek72, You're right of course, but it's good that Endemondo gave us the warning - particularly as the software claims to work on Vista systems, which were very much lower spec than today's. I can't use it the way it is intended because it is designed to use C as the main or only drive. My main drive is partitioned so that my main drive for documents and programs (other than 32 bit) is D. While Vole Windows Expedition Pro will access D easily, it doesn't do that other than as a file explorer. I'm sure it would be very valuable if I could set D as my main drive. Download was slow, couldn't register. Ran without registering and it took ages to open up a really outdated and almost childish looking window, takes a long time to respond. I've said it before but that standard of the software offered is very sub-standard. Really don't know why I bother.